Modern technology has made it possible for humans to perform tasks that were once deemed impossible. Hydraulics, for example, have made life easier by giving a man the power to produce immense force from a slight nudge. This technology has been coming in handy in the automobile world where it is being used for car brakes and even steering wheel systems. Since hydraulics work with the help of a lubricant or fluid, you have to keep fluid levels in check. But there are a lot of things to consider before you can decide on the best fluid for your steering system. It all depends on the type of power steering you have in your car and the model as well as the make of your car. In this article, we will talk about power steering systems in general and power steering fluids in specific. Before we talk about the different power steering fluids available in the market, we shall shed some light on power steering fluids in general. The power steering fluid makes sure that your vehicle’s power steering works smoothly. Thanks to the fluid, the entire steering system stays responsive. The fluid is generally made up of silicone or mineral based oils but synthetic oil is also used. The synthetic oil is usually similar to the automatic transmission fluid seen in most cars. Different types of fluids are fit for different types of power steering systems. In this way, if you use the wrong kind of fluid for the wrong steering system, you could seriously damage it. A power steering works by activating hydraulic actuators that transfer precise power to the wheels and help turn your vehicle. This way you don’t have to use immense strength to turn your vehicle. In other words, you can apply a minute amount of force, and the hydraulic system will multiply that force ten-folds and cause you no difficulty. The steering wheel is connected to the hydraulic actuators that are in turn connected with the axle, so even if the hydraulic system fails, the steering will be able to function. Therefore, it is not an immediate problem if the hydraulic system fails, but you have to keep in mind that replacement and repairs can cost a lot of money. If you fill the wrong fluid in the power steering system, the entire system can get destroyed if you are unlucky. Therefore it is integral for you to fill the proper fluid. Furthermore, if you are not mindful of the lubricant levels your power steering system can deteriorate over time and cause problems for you. Fortunately, a failing power steering system gives out tell-tale signs that can point to impending failure. Power steering fluid can also leak. There can be a hole in your reservoir or in the lines connecting the reservoir to the chamber. To solve that, you can pour in a leak sealant and then pour in the power steering fluid. 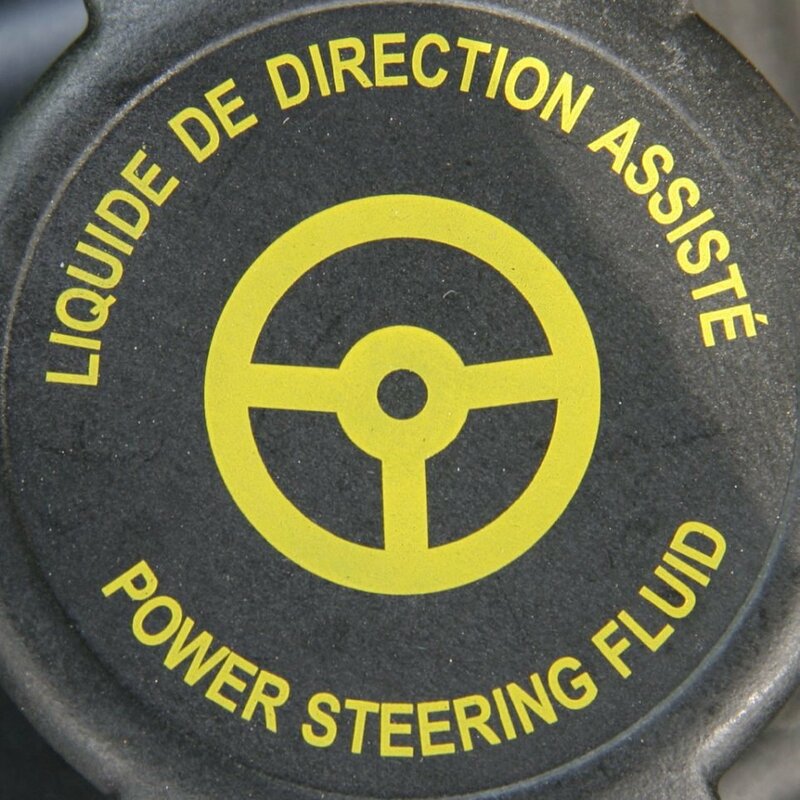 A power steering fluid is usually marketed as one but some steering systems can use different liquids. The other most commonly used power steering fluid is an automatic transmission fluid. This lubricant is less dense, and it handles hot temperatures quite well making it an excellent alternative for mainstream power steering fluids. But then again there is not one transmission liquid out there. There are different types of automatic transmission fluids, and the right one has to be chosen. 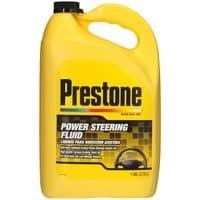 When you are deciding on a power steering liquid, the best decision is to take into account the manufacturer’s recommendation. Take out the user manual provided by your manufacturer and check the section on fluids. There you will find the recommended quantity of the fluid and the correct fluid that goes into the system. Sometimes the power steering fluid type is printed on the power steering fluid container’s cap. If you still do not find something anywhere, then you can go to your nearest mechanic and get a professional consultation. These consultations do not cost a lot of money, but even if they do cost a lot, you are saving yourself from future turmoil. There are mainly two types of power steering systems – One works on the conventional principals of physics while the other uses the concepts of electricity to activate actuators. Most modern cars have abandoned the use of a hydraulic power steering because you have to check for power steering fluid regularly. The fluid can leak or get contaminated resulting in a power steering failure. Such problems do not present themselves when you have an EPS or Electronic Power Steering. An electronic power steering uses electric pulses to activate actuators which in turn send power to the steering rack. As long as the electronic system is sending signals to the wheels the steering wheel will work effectively. If it fails, then the steering will get hard. Fortunately, there is no need to check fluids in a hydraulic system, which is why EPS is pretty famous among all the automobiles today. There are quite a few things to consider when changing the power steering fluid. Keeping all the considerations in mind, it should be noted that hydraulic systems are pretty difficult to maintain. This is especially true for those people that are not so good with cars. Such people are at the behest of technicians and mechanics who can say and do anything to make a hefty bill. Therefore, it is the responsibility of all car owners to learn about all the basic maintenance works of a car so that you cannot get fooled by a mechanic. Always keep check of the fluid your power steering system needs, its quantity, and quality. Furthermore, it is also a good idea to go with an EPS system if you don’t have one already. Hydraulic powers steering systems have their advantages over EPS systems though, which are too good to ignore.